Thank you for attending the All Candidates Forum last night at the Creekside Theatre. Candidates spoke to a crowd of over 150 people who came out to listen to their views regarding key issues is Lake County. We hope the event offered you an opportunity to meet the candidates and has helped you to make an informed decision in the upcoming election. Thank you to Kirbey Lockhart, Lake Country Chamber of Commerce Past President, for moderating the event. 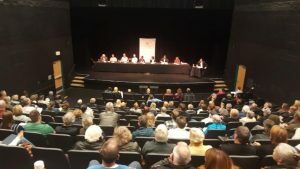 PreviousPrevious post:All Candidates Forum 2018NextNext post:Compass Cannabis 50+ members attend!